Using collaboration and design-thinking, LRNG Innovators Challenge grantee “Creating with Confidence” revamps AP Art to encourage students to create art with public purpose. Radwan Khatib, a junior at Warren High School in Indianapolis, had always thought of art as a solo endeavor. But this school year, the school’s two Advanced Placement art classes undertook a six-month long “design-thinking” project that led students to create two public artworks through a collaborative, problem-solving process now used in industries including health care, software design, industrial design, and even public policy. The “Creating with Confidence: Design Thinking for Public Art” project is supported in part by an LRNG Innovation Challenge grant. The grants stem from a partnership between the National Writing Project and John Legend’s Show Me Campaign to help educators extend time and space for connected learning. The connected learning theory posits that learning happens on a continuum—in school, as well as at home, work, and among friends—and is driven by students’ own interests and life experiences. Several students who participated said that learning to listen and compromise with one another was one of the most valuable skills they learned. While research shows that professions requiring interpersonal skills in addition to technical skills are expanding faster than those that don’t, at school, students typically work in isolation. Warren High School serves an economically and racially diverse population from the city’s East Side. Almost 70 percent of students qualify for free or reduced-price lunch, more than half are African American, a quarter are white, and the rest Hispanic, Asian, or multiracial. Although some of the 28 juniors and seniors enrolled in AP art are top students, others are struggling at home or in school and “really rely on the arts as their strength to get them through,” said Cassandra Thomas of Arts for Learning in Indianapolis, which spearheaded the project at Warren. The project began late last fall with a series workshops at the Herron School of Art and Design led by associate professor and director of the graduate program in Design Thinking and Design Leadership Youngbok Hong. In an airy studio, she led students through the early steps in the design-thinking process, which requires innovators to define, ideate, prototype, and test. To define their own problem, students spread their sticky notes on the floor and looked for patterns. A lack of communication with others and too little time emerged as the most common themes. Guided by a local artist, one class continued with time as their theme while the other tackled communication. “We did a lot of sketching and sharing sketches and editing each other’s work,” recalled senior JoDee Lynch, who intends to pursue interior architecture. Finally, the time group settled on a video made of still photographs that expressed their theme. Over months, they collected images—a tree through the seasons, a trip down a waterslide, Destini’s uncle’s hamster running on its wheel—symbolizing time’s monotony. The communication group, meanwhile, designed a vibrantly hued public bench to encourage strangers to interact. 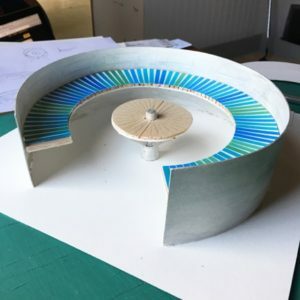 Students created two prototypes of the bench, shaped like an open circle. To test their ideas—the final step—they collected feedback on their photographs and bench designs at an event attended by 200 students, teachers, and parents. Based on audience feedback, the most compelling photographs and the favorite bench design went into final production. Students combined their best images in a video. They added the measurements for the favorite bench into computer software and, after further adjustments, sent it to a metal working company that they also visited to see their design cut, shaped, and welded. In late April, at the school’s annual art fair, the completed video was projected in a continuous loop on four nine-foot high screens in the school atrium. Nearby, a portion of the steel bench was displayed along with a model of the final design.